To help a friend, Bambang Suwanda, we would like to present you a collection of DVD's specifically about west-javanese pencak silat. We also would like to do this as a hormat to Bp. Ujuh Suwanda and his son Herman Suwanda. All the money will go directly to Bambang Suwanda, to help him and his family set up a padepokan in Bandung. He is in great need of assistance and with the selling of dvd's he can continue the legacy of Mande Muda in Indonesia. This is a special-edition 6 DVD collection assembled especially for enthusiasts of Indonesian Pencak Silat. Each DVD is dual-layer, and contains two hours of instruction filmed on location in Indonesia. This is a unique collection of styles, systems and techniques from one of the leading Pencak Silat masters in the world today: Bambang Suwanda. 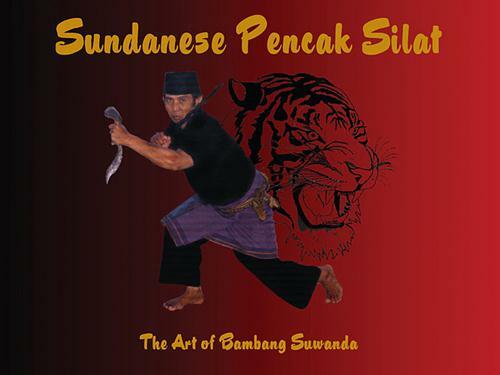 Originally filmed to be part of the new Sundanese Silat Jagabaya series, this DVD contains the first 10 Jurus, Buah and Pecehan for each, as well as an in-depth session on the Suliwa system, loaded with techniques. Second in the Sundanese Jagabaya series, this DVD has the remaining Jurus 11 to 20, with extended Buah and Pecehan for each. Also included is Kerambit, leglocks and foot pressure points, as well as Silat Dasar - The Indonesian energy form. This is a smorgasbord of systems and techniques from several different regions of West Java. Included are Jurus and Buah for Monyet and Cikalong, as well as Jurus Kaki (foot sweep methods) Sarung, Knife and miscellaneous techniques from various other systems. Various Jurus and Buah from two of the major systems of Indonesia. The grappling system of West Java, Bambang Suwanda is a master of this technique. Also included are 15 new Jurus and Buah in the Sundanese Harimau system, as well as an intricate look at the various methods of using the legs to lock the arms. This is the one you don't want to miss: Six different Indonesian Flower Dances both performed and taught in step-by-step instruction - Paleredan Cikalong, Tipak Tilu, Sera, Golok, Double Golok and Padundun. There are several full-out demonstrations included, as well as a private lecture given by Bambang Suwanda on the various systems and origins that make up Sundanese Silat and Mande Muda. As a bonus, there is a special downloadable folder containing MP3 files of the music, so you can practice and train with the actual music in the instructional videos. Individual DVD's are available for $55.00 apiece, or $225.00 for the entire set. DVD's are region-free, and will play in international DVD sets. Bear in mind, these are dual-layer DVD's, and may not play in their entirety on older player models. All DVD orders are shipped priority mail, included in the price of the DVDs to anywhere in the United States and Territories. All international orders (non-US) are shipped Priority Mail as well, but with an additional $15.00 surcharge.